This 9mm Winclean ammo by Winchester Super-X provides shooters with an enjoyable and clean training option designed for use in both indoor and outdoor ranges. Winchester established the Super-X brand back in 1922, and it has developed a loyal customer base of shooters with a variety of shooting needs. 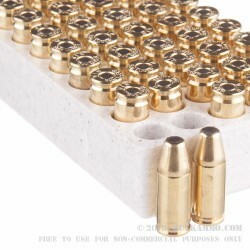 These high-quality range rounds have 124gr brass enclosed base (BEB) projectiles crimped into their Boxer-primed brass casings. The BEB is essentially a full metal jacket bullet built backwards where the bullet's base is covered with brass so that it avoids contact with the hot gases reducing airborne lead. Winchester uses primers in this load that do not contain lead or other heavy metallic components that can pollute a shooting environment. 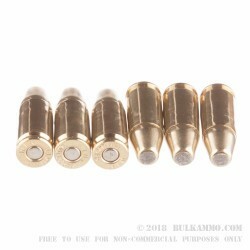 The casings used for these cartridges are non-corrosive and reloadable. Since 1866, Winchester has provided American shooters with premium arms and ammunition for hunting, practice, and self-defense. 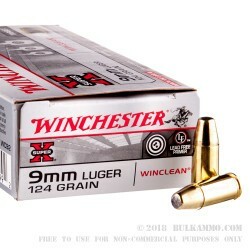 If you're looking for a reliable 9mm range round, look no further than this 500-round bulk case of Winchester Super-X! Q: I'm not familiar with the term "brass enclosed base". Does that differ from normal brass cases used for ammo? A: The case is not different the bullet is however. Typical bullets have exposed lead at the base. When the powder ignites, on a typical cartridge small amounts of lead can be vaporized and in very poorly ventilated conditions can cause trace amounts of lead exposure. While not entirely reducing that to nothing, the BEB rounds drastically reduce that chance to much safer levels. This particular bullet is primarily designed for indoor ranges, but would also be a great outdoor range round as well. A: Winchester ammunition is manufactured at their plant in Alton, Illinois. Q: U can send it to Europe?? ?